The days are flying by and we still have so much more to do. Roger has a list and I have one too. I did get to storage and got a lot of things out, thrown away or stored below. (just a few things) Roger has been collecting bottles and throwing them out or getting them ready for sale. I tried to get a groomer to trim Lola but to no avail. One wanted two days and keep her in a tiny crate all day. That was a no. The mobile groomer that was over 200.00 was out too but then I found one closer that was under 100.00. I was thrilled. They called after being late and the gentleman was in the hospital with chest pains. 😟 I took it as a sign and ordered grooming scissors and plan on trimming her myself until we get to NH. Yes, dusty and dirty but fixed. 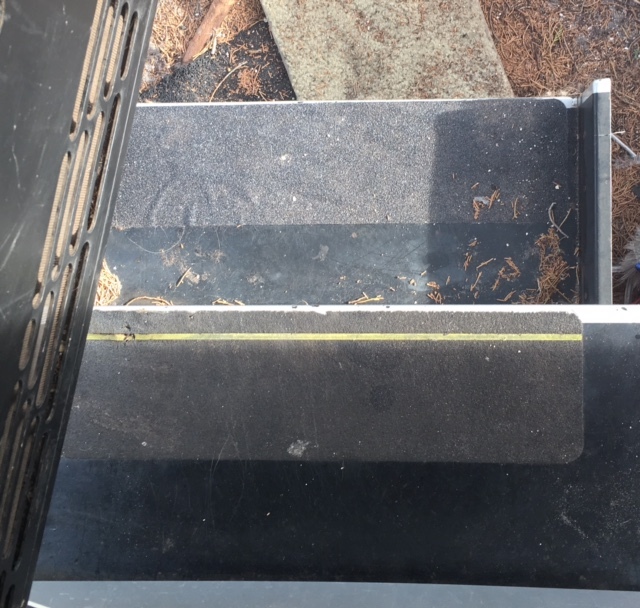 There had been a hole in our stair and Roger painted it with rust stuff, (it turns rust into a polymer like substance preventing it from rusting again) then used a bondo product that put a resin into the hole. He places an aluminum plate below to hold the resin and when it hardened put a new mat over. Voila'. Good as new! My storage area is almost empty, one more trip and happily our bays are rearranged and ready. 10 days. So, how am I feeling about leaving? excited, nervous...leaving a known equation to something unknown. I have always had this thought though since I was young that if I got to the end of my life and didn't do what I wanted..traveling and seeing everything I've dreamed of. So far it's been Scotland twice, pretty much all the islands in the Caribbean, Amsterdam..ok, it was the airport, but I saw it. Flew over Ireland and got to see it pretty well, then years ago drove across country and back in two weeks. 😵 Now I'm ready to slow it down and actually SEE America! Not sure if I showed you this but before our friends Diane and Paul left, Diane sewed our awning. She was afraid if I got up there and stretched my neck like that I'd never move again. Bless her! The wind grabbed it one day and the rubber cord that was there popped out of it's "holder" and she and Paul were able to get it back in place. All is well. 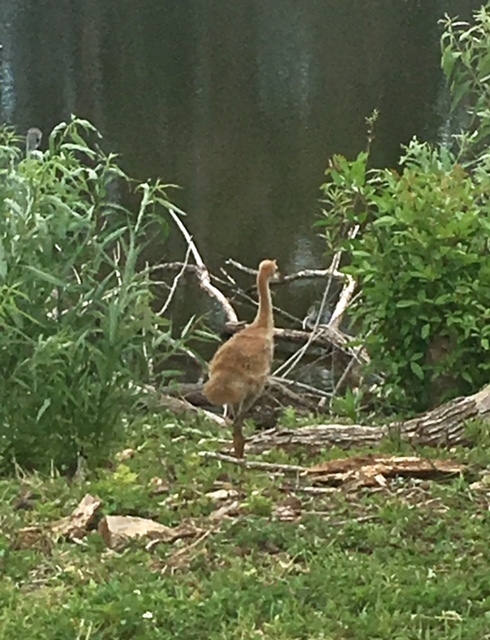 The baby Sandhill Crane is growing quickly. This was taken about two weeks ago and already he's loosing his orange tint and turning the gray brown coloring. SpaceX ! We have lived in Florida since 1999 and have been privileged to step outside our door at our sticks and bricks and watch all the shuttle launches and now being here, the Spacex and Air Force rockets go. Roger had been a programmer working along side the Air Force with their rocket program so it's always been a treat to see them fly. But then everyone who lives in the Space Coast feels the same. This launch may be our last for awhile. Then in my spare time... I'm finishing up on my commissions and gathering new work to start when we get to New Hampshire. This is an 8" x 8" watercolor on 300lb paper. I purchased a new bottle of Maskit. Maskit is a fluid that you brush on the areas you want to keep free of the color you are adding. 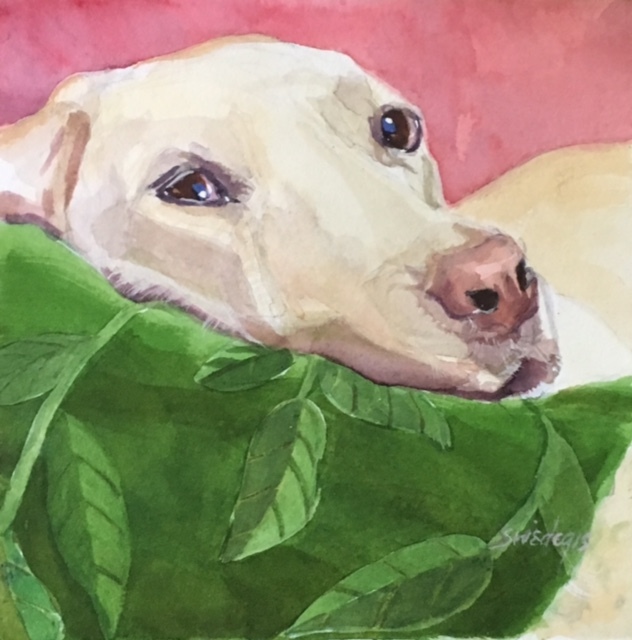 So for the pillow I put it on all the leaves and along the edge of the dogs face then I could add as many washes that I needed to get the look I desired. Rubbing it with your finger removes it quickly after all is said and done and this particular Maskit, or Frisket, just pealed off in one strip. Then I painted the leaves. Roger just made a huge order, (I think it gave him a headache, haha) and it will all be here before we travel over to Cummins. A new sewer hose. The one we have now has a leak and we don't want to be like Robin Williams in the movie RV. Our Tire monitor hook up and a air compressor for our tires. I have become somewhat of a fanatic about safety, which isn't a bad thing, so it was the tire monitor before we roll and Roger added the air compressor. Fair enough. I'd hate to have a low tire pressure in the middle of no where. It was a joint "yea" on the sewer hose. Then a fun thing that I received as a gift and still need to learn how to use them. My artist friend Suzanne didn't use them so gave them to me. So excited to start. Plein air working with the crayons and my water paint brushes. These could be a lot of fun!! Ok, stuff to do today so I'll sign off. Have a great day and I'll be back tomorrow. I'm feeling like we are now on the launch pad out at the Space Center and the count down has begun. Feeling the rumbling, the excitement and the nausea. 😰 (haha) It's all good! P.S. Something fun. We went to dinner at our sons the other evening and he started doing karaoke. That's me laughing hysterically in the background but so amazed. ❤️❤️❤️❤️. Love this post but am in denial that you're leaving. I'm going to miss you wicked. 😔. But, I'm so excited to hear about all your new adventures! (And you know that we won't be too far behind if history is any indication hehe). 😁.